We’ve been featured on Wedding Chicks! 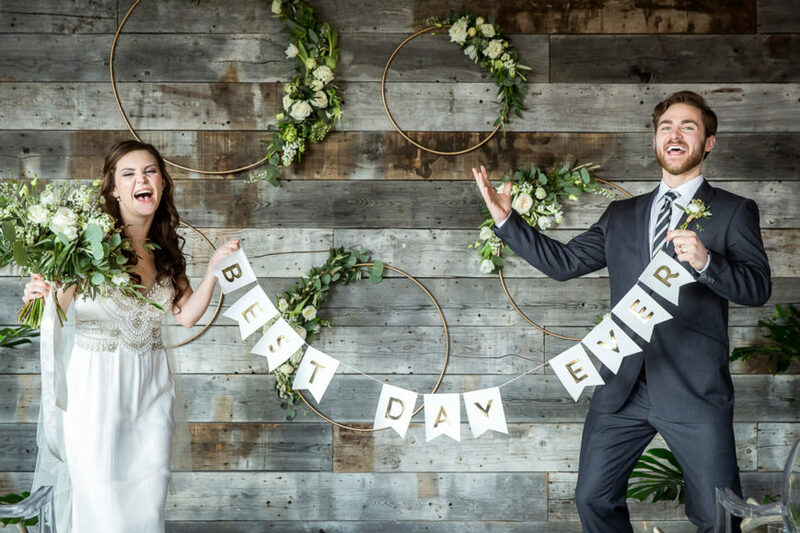 We were so excited that our Modern Rustic styled Shoot was featured on this major wedding blog! For more information and full credits check it out here! We’ll be posting more from the shoot in the coming weeks. For more information on planning your Canadian Rocky Mountain wedding in areas including Canmore, Banff, Lake Louise, Jasper and Fernie, contact Naturally Chic at 1.403.679.1409 or email us at hello@naturallychic.ca. Banff wedding planner Naturally Chic is mentioned as a contributor in Horse-Canada Magazine for wedding planning advice on farm weddings! In early January, I was contacted by writer Deborah Wilson. Deborah was working on an article about farm weddings for Horse-Canada magazine. She asked if I could share some planning tips. A horse-owner myself, I was thrilled to contribute to her article. I was even more thrilled to see the article “Advice for Planning Farm Weddings” in the May/June 2014 edition of the magazine! Congrats to Deborah for her wonderfully informative article. 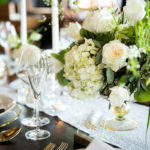 Congrats also to my fellow WPIC colleague, Karen Sagle of When Sparks Fly Wedding and Events, who also contributed planning advice to the article along with Naturally Chic. Banff wedding planner featured in Horse-Canada magazine! Groomsmen riding in on horseback to the ceremony is fitting for a farm wedding! A farm wedding affords amazing photo opportunities! 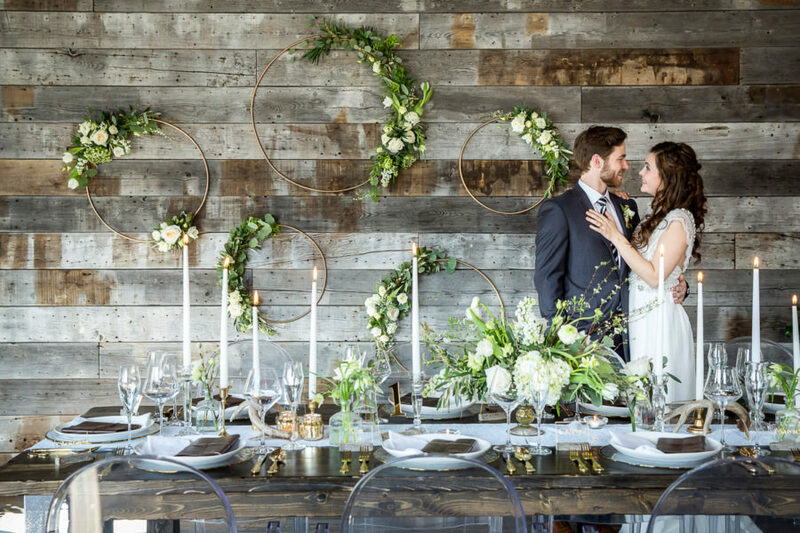 If you’re nterested in planning a ranch or farm wedding in the Rocky Mountain foothills, Calgary or anywhere in Alberta, contact Naturally Chic at hello@naturallychic.ca! 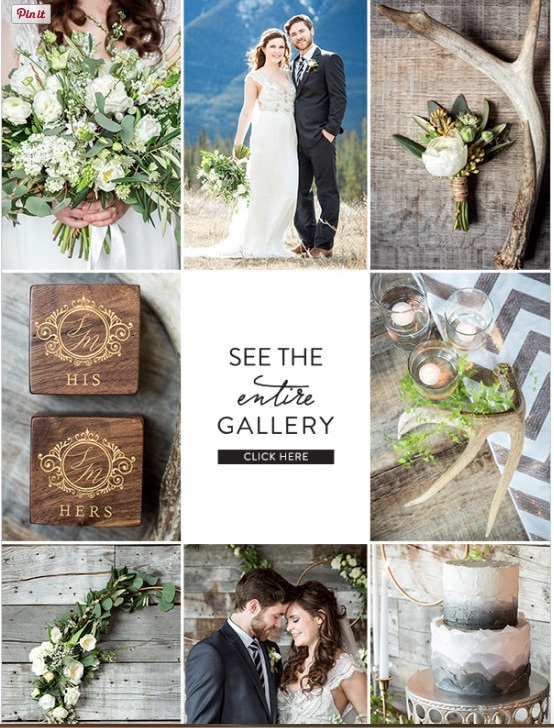 I am so pleased to be able to share with you some beautiful photos, taken by Tara Whittaker, that are featured in the Calgary Bridal Guide (on newstands in and around Calgary). We are so honored to have our table design featured! Back in the spring, I shared a sneak peek, but have a few more photos to share as well as my inspiration for the table design. When I was first asked to participate in the Table Top Design Challenge at the Vintage Wedding Showcase put on by A Spoonful of Vintage this past spring, I wasn’t sure what theme to choose for my vintage table inspiration. I really wasn’t particularly familiar with Downtown Abbey, Breakfast at Tiffany’s or even the Great Gatsby. I decided to do a little research like watching “Breakfast at Tiffany’s” to see if this glamorous period was a good fit. I also considered the “Mad Men” 1960’s era, because in every picture I had ever seen of sixties interiors, there was a lot of wood. Since wood is one of my favorite mediums to work with, I thought this might be a good fit! I actually had never watched “Mad Men” prior to the Vintage Wedding Showcase Challenge. I’ve since caught up on all the Seasons and was instantly drawn to the show and the period. I then started researching sixties design and decor and became very fond of the works of Scandinavian furniture designers, Eames and Saarinen. These Scandinavian designers had a huge influence on the era with their clean, mid-century designs. The whole era was actually an exciting time of change, not only in fashion and design, but in politics, human rights and other world issues. If you’ve ever watched the “Mad Men” television series about advertising executives in the 1960’s, the show transitioned from the late 1950’s into the early sixties, followed by a more hip, mod period of the later 1960’s, where bright colors and geometric patterns prevailed! For our table design, I didn’t want to just recreate a sixties interior; I wanted to reinterpret the era with a modern sensibility. I chose avocado green and orange as my main color palette, with accents of gold because these colors were so prevailent in sixties interiors and fashion. I scoured thrift stores to find vintage accessories and paired it with family heirlooms. It was surprisingly easy to find modern pieces to work into the design scheme, just walk into any Ikea store! I think incorporating a “Mad Men” theme of 1960’s design, fashion and culture would be so fun for couples to incorporate into their wedding day. Think sixties fashion, a vintage typewriter as your guestbook, swing dancing and of course, the well-appointed bar complete with classic cocktails! Classic cocktails were all the rage in the 1960’s and are become increasingly popular in modern day weddings, with the classic drink bar starting to replace the “signature cocktail” which has been so popular at weddings over the past few years. In researching flowers that were popular in the sixties, I found that unstructured, loose flowers were really popular, much the same as today! 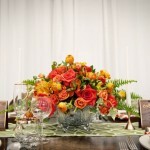 This gorgeous arrangment was created by talented Calgary florist, Sarah Mayerson Design. I had actually just been given some vintage crystal bowls and thought they would be a perfect vessel for flowers because crystal was so popular in the sixties. Apparently cyrstal was popular to give as a wedding gift too! For this table setting, I used classic sixties candle holders with white taper candles that were popular during this time. I made cocktail menus from walnut wood veneer and accented with gold foil. The cocktails were classic cocktails popular in the sixties: Old Fashioned; Manhattan; Vodka Gimlet; Whiskey Sour, Blue Hawaiian etc. For our place settings, I chose two different place settings, but with coordinating napkins in a geometric pattern. I used vintage silverware and vintage gold rimmed glasses that I found at various thrift stores. For the menu I again used wood veneer in a classic walnut with gold accents, and a gold chain as a nod to the popular fashion trend of gold chains worn during the sixties. For “place cards” I used small pieces of reclaimed walnut and an engraved gold plate to mimic the classic name plates that were commonly seen on the desks of advertising executives on the television show “Mad Men“, but also on the desk of most executives in the sixties. I chose to use a matchbox as a wedding favor as that was a common favor found at real weddings in the 1960’s and 70’s. I updated my favor with engraved wood veneer and the couple’s monogram (again a nod to the television show Mad Men). Engraved wood match box 60’s wedding favor by Naturally Chic | Photo by Tara Whittaker Photography. Here’s another few looks at the table! Mad Men inspired wedding table by Naturally Chic | Photo by Tara Whittaker Photography. I had to include breadsticks which seemed to be on every table in every restaurant or venue in the 1960’s. A vintage men’s fedora that perhaps Don Draper or Roger Sterling would wear! A “Hang-over Kit” would be fun to incorporate into a modern day wedding! We made these little kits and added things like aspirin, breath mints, rolaids etc. You could also add a bottle of water or sports drink and leave in each of your guests’ rooms. What Sixties story would be complete without the classic “Slinky” toy! This would be a fun wedding favor! Here’s a shot of our booth! I made the Naturally Chic sign to mimic the signs found on the doors to the Sterling Cooper Agency (from the show). The table was made by Don from Naturally Chic and the chairs were Ikea chairs I painted in avocado green and white for a hip mod look! Let us know if you are planning a Vintage or 60’s themed, Mad Men Wedding!! Contact Naturally Chic at 1.888.679.9056 or email us at hello@naturallychic.ca. Yesterday we shared Noorin and Asif’s beautiful ceremony at the iconic Fairmont Banff Springs terrace. Today we’re sharing their elegant reception in Mt. Stephen Hall. This stunning image of the couple was taken by the very talented Yueko Image. You can also check out the January 2013 edition of Avenue Magazine to see it featured there! Mt. Stephen Hall in the iconic Banff Springs awaits the arrival of the newlyweds! Ready and waiting for the stars of the show! Decked out in boxing gloves, Noorin and Asif face off in one of the coolest Grand Entrances! The couple battled it out for several minutes before the referee declared it was a draw (I still thought Noorin scored enough points to be declared the winner. She may be small but she’s feisty)! For the reception Noorin changed into a traditional white wedding gown. She looked amazing! Guests were greeted to a lovely thank you card from the couple at their place setting. Looking stunning, the couple cut their equally stunning cake! It was a beautiful day in the mountains! The following are snapshots of the reception taken by Naturally Chic. We were thrilled to provide some special touches to Noorin and Asif’s wedding including wiring roses on to birch branches, and making several engraved mirror wedding pieces including table numbers, seating chart, signage and a hand made mirrored card box. Noorin and Asif are incredibly warm and kind people and it was a pleasure working with them on their wedding. It’s evident that these two understand the importance of the love they share for not only each other, but also their family and friends. I was especially touched by the couples favor. A donation was made in memory of Asif’s father (a botanist and educator) to help impoverished children in Bangladesh (to the Pubail Village School). Noorin and Asif are a wonderful couple and I have been blessed to work with them (and was fortunate to see on their Anniversary weekend! Noorin and Asif I wish you “nature, wealth, sweetness, harmony and good health” and all the best in the world! See more beautiful photos on Yueko Image blog, as it was a two part posting and there are some seriously amazing photos there. Part 2 is all about their Banff festivities! If you’re planning a wedding in the mountains, carefully consider the items you will need to take to the site. Tip #25 – The Rockies are a playground for adventure! Are you considering an adventure wedding? If so, the Canadian Rocky Mountains are a playground for adventure and a perfect for an adventure wedding! What exactly is an adventure wedding you ask? An adventure wedding is a wedding that incorporates an outdoor, adventurous activity into the ceremony itself or into some aspect of the wedding; think whitewater rafting, skiing, dogsledding, heli-hiking or horseback riding etc. The activity can be just for the couple, or the guests can also partake in the activity. There’s no right or wrong way to have an adventure wedding. The only rule is to have fun! Of course, not everyone will want to go all out with an adventure wedding. You and your guests can still enjoy some outdoor activities as part of the overall weekend. Often couples have guests coming in from all over, many that have never experienced the rockies. Even if you’re not planning to schedule group activities, it’s a nice idea to include information on various activities that your guests may enjoy. Pop some tourist brochures into your guest welcome packages, or you include a card with information on you and your partner’s favorite activities to do in the area. Hiking, golf, snowboarding and rafting are always popular guest activities. Naturally Chic can help with all the arrangements. We’ll help with all the usual wedding arrangements as well as help with obtaining permits, arranging transportation, recommending videographers and guides, and any other task necessary to make your dream a reality. We LOVE adventure and would be thrilled to help you out with whatever adventurous idea you may have. Whatever your desire, we’ll help make it happen.